Laser has been used efficiently for treatment of oral lichen planus, leukoplakia, aphthous ulcers and oral manifestations of HIV. Two cases of recalcitrant oral pemphigus vulgaris that were successfully treated with CO 2 laser are described. The patients had been treated by a dermatologist with pulse therapy of methyl prednisolone and cyclophosphamide over a period of 6 to 8 months, but the clinical course was characterized by episodes of painful flare-ups and nonresponsiveness. The patients were extremely uncomfortable with recurrent oral lesions. CO 2 laser at low power was used to irradiate the lesions. It was shown to be effective in relieving pain and healing of lesions, with nonrecurrence. To the best of our knowledge, this is the first case report of such a treatment of oral pemphigus vulgaris. Further clinical studies are warranted to confirm efficacy and to optimize the treatment protocol. Systemic steroid therapy is still the mainstay of treatment for pemphigus vulgaris; however, this treatment modality is limited by various adverse effects. To reduce the side effects, steroid-sparing agents are often used. Some patients do not respond to such treatment modalities. Management of recalcitrant pemphigus vulgaris poses great problems. It has been proposed in literature that CO 2 laser can be used to treat vesiculo-bullous lesions in the oral cavity. Lasers have been used to treat leukoplakia, lichen planus and for palliative effect in aphthous ulcers and oral manifestations of HIV. We have described 2 such patients of oral pemphigus vulgaris who were not responding to systemic steroid therapy. CO 2 laser at low power was used to relieve pain, discomfort and prevent recurrence of the lesions. 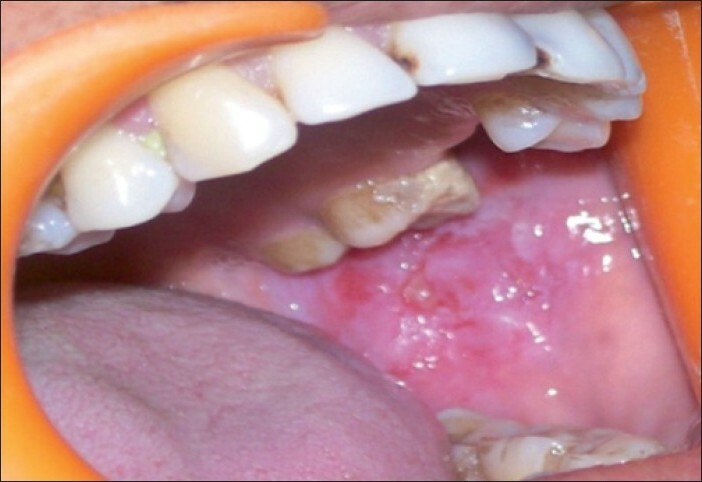 A 40-year-old woman presented with 6-month history of burning sensation in gums, pain while swallowing and brushing, with painful gingival erosions and desquamation [Figure 1]a and b. There were denuded, spontaneously bleeding gingival zones. The gingival margin and some areas of attached gingiva and interdental papilla were erythematous and denuded. Positive Nikolsky's sign was present. 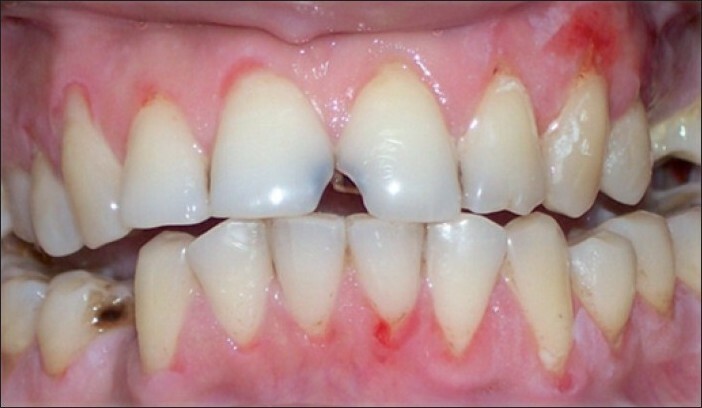 The lesions were typical of desquamative gingivitis. The clinical picture with positive Nikolsky's sign offered insight into the possibility of presence of a vesiculo-bullous disease. She had undergone treatment for gingivitis by a local dentist but without any improvement. The medical and family histories were not significant. Extra oral examination revealed no abnormalities. A perilesional incisional biopsy was performed. Histopathological examination revealed partially denuded squamous lining with suprabasal separation and villous projections lined by basal layer. Scattered acantholytic cells were seen with underlying dense chronic inflammation [Figure 2]. Tissue for DIF (direct immuno-fluorescence) showed detached epithelium with 2+ granular squamous inter-cellular substance staining for IgG and minimal staining for C 3. IgM was negative. A final diagnosis of pemphigus vulgaris was made on the basis of clinical, histopathological and DIF findings. The patient was treated with pulse therapy of methyl prednisolone and cyclophosphamide by a dermatologist over a period of 6 months. The disease proved to be recalcitrant to this therapy. New erosions developed on left buccal mucosa [Figure 3]. The gingival lesions were unresponsive to treatment even with addition of potent topical corticosteroids [Figure 4]. The patient was extremely distressed and depressed because of the unremitting disease activity. It has been proposed in literature that CO 2 laser can be used for treatment of not only white lesions, premalignant lesions but also for vesiculo-bullous lesions in the oral cavity. This prompted us to try therapy with CO 2 laser. CO 2 laser at 1.0-1.5 W, was used. 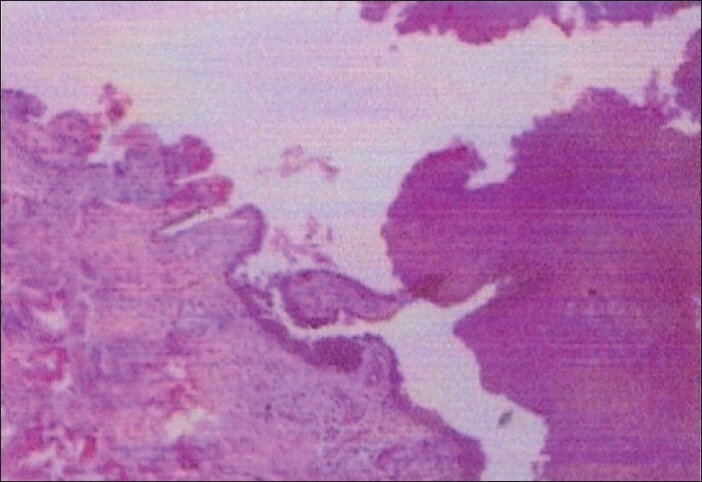 The lesions were irradiated in a defocused mode for 5-10 [Figure 5] a-c. The patient became symptom free. Recall examinations after 1 month, 3 months and 5 months revealed complete healing of lesions [Figure 6]a-d.
A 50-year-old woman was referred by the Department of Dermatology for dental opinion of oral pemphigus vulgaris lesions. Fluid-filled blisters, bullae and vesicles were present on soft palate, buccal mucosa, gingiva and muco-buccal fold areas [Figure 7]a-c. The patient suffered from pain in mouth, difficulty in speaking and eating. She had visited a dentist for the same problem 3 to 4 months back and was prescribed topical steroids but there was no improvement. Medical history revealed that she had been treated for skin lesions with methyl prednisolone and cyclophosphamide for at least 7 to 8 months, but the oral lesions were not responding to the treatment and were recurrent. A biopsy was obtained. Histopathological examinations revealed suprabasal shedding of surface layers with acantholytic cells [Figure 7] d. DIF studies showed granular deposits of lgG and C3 in intercellular spaces between keratinocytes. A final diagnosis of pemphigus vulgaris was confirmed. It was decided to treat these lesions with CO 2 laser, as for the previous patient. CO 2 laser was used (10.6 nm wavelength continuous wave at 1.0-1.5 W) to irradiate the lesions on one side of the mouth for 5-10s [Figure 8]a-c. The patient reported no pain after treatment. The healing process was checked at 1-month and 3-month follow-up visits [Figure 9]a-c. No recurrence was seen. Subsequently other lesions were treated. The patient was symptom free. The outcome in our cases suggests that CO 2 laser may be an effective treatment option for recalcitrant pemphigus vulgaris. In our experience, laser irradiation provides pain relief and improved wound healing, and lesions usually do not recur. However, further studies with randomized controlled trials are required to establish the efficacy of laser in the management of oral pemphigus vulgaris patients. 2. Pick RM, Pogrel MA, Loh HS. Clinical application of CO 2 laser. Lasers in dentistry. In: Miserendino LJ, Pick RM, editors. Quintessence: Chicago; 1995. p. 145-60. 6. Parkins F. Effects of Nd: YAG laser treatment of intra-oral aphthous ulcers and herpes labialis. J Clin Laser Med Surg 1993; 11:335-47. 10. Miserendino LJ, Levy G, Miserendino CA. Laser interaction with biologic tissues. Lasers in dentistry. In: Miserendino LJ, Pick RM, editors. Quintessence: Chicago; 1995. p. 39-56.